Castillo de Burgos is an enchanting fortress of Spain and is also one of the first buildings of the city. 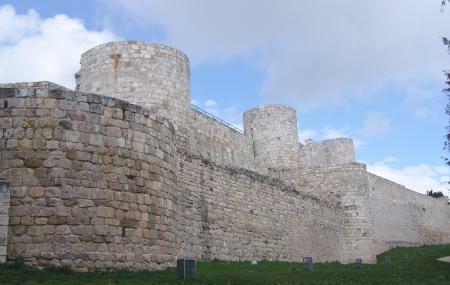 Count Diego Porcelos is the man behind this building who built this for defensive purposes in the year 884. The fortress was imperative to the “Reconquista” which was a historical process where Christian Kingdoms sought to control the Muslim rule. The Door: There are 2 doors here; one recently excavated and popularly known as the South Gate and the other one that faces the North West. The Pozo: The pozo is an underground well that contains immeasurable data from the past. The Gunpowder Factory: One of the many secondary activities carried out here was, the gunpowder factory. Alcazar: This place also referred to as Alonso X was inhabited by the royal prince Joan X II along with his father Henry X II. Castillo de Burgos is also known as the Burgos Castle. How popular is Castillo De Burgos? People normally club together Historic Center Of Burgos and Burgos Cathedral while planning their visit to Castillo De Burgos. The empty remains of the castle of Burgos are worth visiting early in the morning just after it has opened. Informative displays in Spanish and English guide you around the castle. The views are magnificent. Worth visiting if you've parked nearby to go to the Mirador. Steps nearby take you down to the city. Beautiful! Great views of Burgos and on a nice day is the perfect place to take a walk . Nice view, conveniently organized space. There is no castle though, but walls and ruins. 60 meters well was very impressive. Better visited by car, plenty of parking right in front of the entrance.